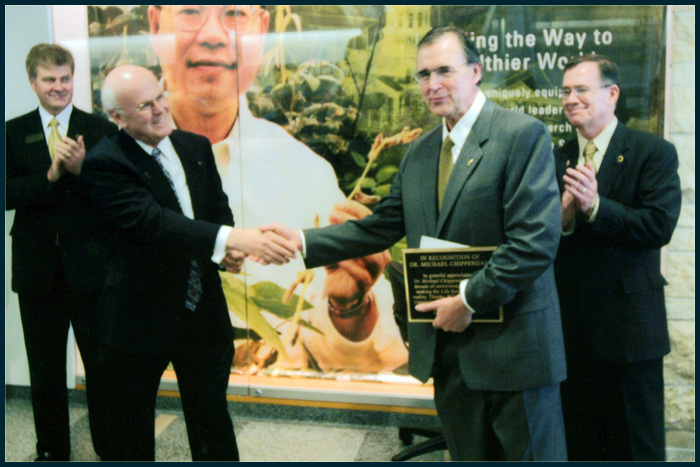 In September 2004 ,at the official opening of the Bond Life Sciences Center, G. M. Chippendale was awarded a bronze plaque for his contributions towards making the Bond Life Sciences Center a reality for the University of Missouri. With G. M. C. are, from left to right, David Housh MU’s Director of Development, R. Michael Roberts, Director, BLSC, and Brady Deaton, MU’s Chancellor. The plaque is mounted to the right of the central door on the north side of the BLSC.